The mixed martial arts and poker worlds aren’t as mutually exclusive as you might think. While one involves the defeating of an opponent by physical force, the other relies upon a much less violent outcome. However, strategy, competitiveness and the ability to pull the trigger are vital across both codes. How about keeping your cool under pressure, or capitalizing on a mistake by your opponent? I could go on. Those are just a few of the attributes that are shared, and they go some way towards explaining why many fighters take to the tables. Over the years we’ve seen several top-flight stars make appearances in poker tournaments, and you can expect to see that number increase. As fighters have downtime in between training sessions, online poker can be the perfect way to keep the brain engaged while letting the body rest, and if you have an aptitude for problem solving then you’re already halfway there. UFC welterweight Martin Kampmann recently turned professional and was spotted at the World Series of Poker, not without success. Several of his traits in prize-fighting have helped him along the way, though he does have some reservations. Top poker star Jason Somerville has taken “The Hitman” under his wing, and this has propelled him way ahead of his experience level. “He’s impressed me since the beginning and I actually think he has a bright future in poker if he chooses to pursue it,” said Somerville on the Dane’s chances of making it in the game. He already has tournament victories to his credit, including a $52,000 windfall that will set him in good stead for the future. He’ll be glad he’s seated above one person in particular, given that he never quite got a shot at him in the cage. That person is former UFC welterweight world champion Georges St-Pierre, who also works the tables and played in the 2013 World Series of Poker main event for the second consecutive year. Though the outcome wasn’t what he would have liked, it appears he will take his cerebral approach to martial arts across the border with him. Now he is focused (for the moment at least) on life outside the cage, as the Canadian is likely brushing up on his card skills and his ability to avoid taking a hit in the chips, no euphemism intended. If he can find enough satisfaction in poker, who knows whether it could influence any potential decision to return to the Octagon. After being the best in the world at something for such a long time, it’d be hard to image that drive not motivating “Rush” to succeed in any form of competition he takes part in. St-Pierre’s long-time nemesis Matt Hughes was also a regular face at Full Tilt, along with the likes of Chuck Liddell and Randy Couture. The retired champions need that competitive itch to be scratched somehow, and often have the bankroll to do so following their illustrious careers. For Buffer, what started as a sideline has since taken a more focused, professional turn. Of course he will always be the voice of the Octagon, but his poker success has continually meant more efforts to further his position in the game. A $75,000 tournament win back in 2010, and more recent hauls in both online and live settings keep Buffer on the winning track, and ultimately it’s winning that keeps those in MMA coming back. That buzz might not be exactly the same, but try telling your body that. 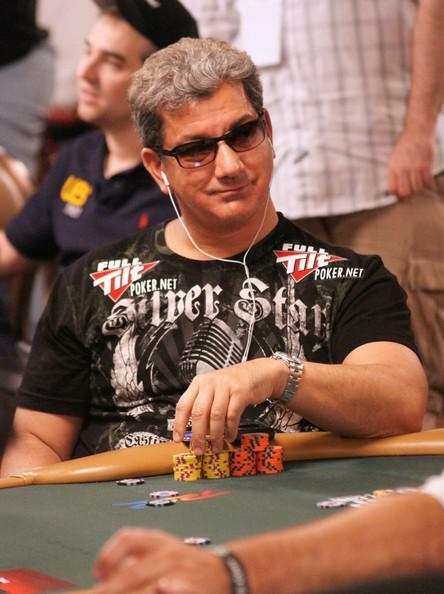 “I can still feel the endorphin rush after felting somebody,” Buffer revealed, and that is the same physiological reaction to success both in the cage and on the tables. As long as the world of fighting and the world of poker exist, they’ll form a symbiotic relationship between them. Action, tension, drama, high and lows – both are as real as it gets.